UK music business training organisation, The Songwriting Academy, has teamed up with coffee house chain Caffè Nero to launch a songwriting competition to find the best unsigned songwriter in the UK—and raise £50,000 for charity. According to the organisers, this is the first time a live, event-based songwriting competition has been launched in the UK where the song is the star, not the singer. The songwriter with the strongest songs will be the winner. Songwriters who are not singers will be allowed to use session singers and musicians. The first prize includes a 12-month development programme with The Songwriting Academy, plus promotion and exposure via Caffè Nero outlets, and support from Yamaha Instruments. Songwriters can enter their songs online HERE before 1st September, 2016. The top songwriters will be selected to showcase their songs at live regional heats across the UK in Caffè Nero stores from 26 September 2016, culminating in a star-studded Gala Final in London on 30 October 2016. In addition, top celebrities and multi-million selling songwriters are all coming together to help the competition raise money for the Stand Up To Cancer campaign and music therapy charity Nordoff Robbins. The two charities will share all profits. The Songwriting Academy is a UK-based songwriting, production and music business training organisation. It aims to help songwriters succeed in today’s competitive music business through the support of a team of leading songwriters, producers and industry experts. Caffè Nero has supported talented grass-root musicians for many years. It was instrumental in supporting the early careers of artists such as Jack Savoretti and Passenger through live performances in many of its 600 UK stores and airplay on Caffè Nero’s in-store playlist. A 5-star rated book at Amazon, “How [Not] To Write A Hit Song! 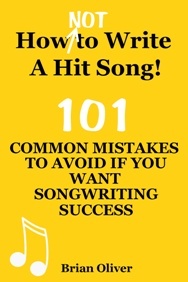 – 101 Common Mistakes To Avoid If You Want Songwriting Success” is available from Amazon as a US paperback, UK paperback and as an eBook from Amazon’s Kindle Store. It is also available from Apple’s iTunes Store (Books/Arts & Entertainment/Music), Barnes & Noble’s Nook store, and KoboBooks.